The Scarpa Crux is sold as a tough yet technical approach shoe claiming to have achieved a balance between providing enough support for climbing and enough comfort for approaches. The shoes weigh in at 828g for a size 42 pair which doesn't make them the lightest pair shoes which can be used for approaches (i.e 580g for a pair of Inov8 Roclite 290) but in striking a balance between durability and weight we feel that they pack quite a punch for a low(ish) weight. The first impression of putting these shoes on is that they fit like a glove, the fit is precise all whilst remaining comfortable. Obviously, this may vary from person to person but having discussed the fit with various friends the consensus has been that there is a good versatility in the fit with regards to different foot shapes. The shoes excel at their given task of being an approach shoe, they are comfortable on long walks and have enough support and grip to be very handy on scrambles and easy climbs. The outer fabric is suede which gives some water resistance but the shoes soak through quickly if used in wet conditions. However, as they are intended as an approach shoe it is noted that approaches to rock climbs are rarely done in the wet so using the shoes in wet conditions is a bit of a non-issue. The shoes on test are this reviewer's second pair of shoes having worn through a previous pair which is a clear indication of how good these shoes are as an approach shoe. 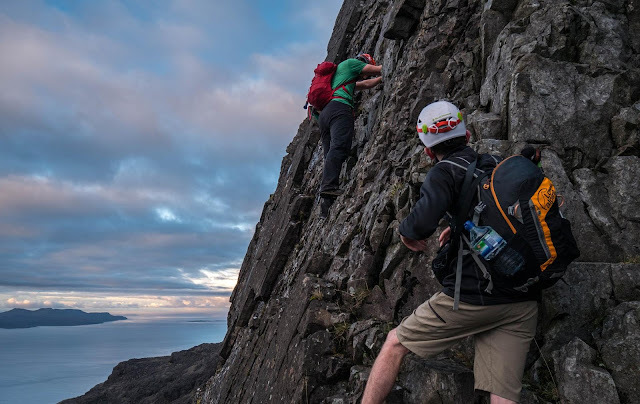 They've been tested in various situation ranging from; easy climbs (they've even been used on a British VS), walking to crags, Munro walking days, approach shoes for mountain rock routes and for scrambling (i.e. the Cuillin Ridge). There are however a couple of things which prevent the Cruxes from being a 5-star item. The first of which is the laces. The laces are plainly atrocious, they are incapable of staying tied (even with a double knot) for more than a couple of miles so you will find yourself retying the laces a couple of times per outing. The best thing to do is to replace these immediately on purchase. The sole of the shoe is also very thin so will wear out quickly if used in environments where the rock is tough (i.e. granite), it also does not have much tread which means it excels on rock but is very poor on wet grass. Things we like: Good build quality, tough outer fabric, comfortable for walking, good grip on rock. Things we don't like: Laces, poor grip on wet grass.